Definition: A graph $G$ that is a tree is considered Rooted if it contains root vertex. A vertex is considered a Root arbitrarily based off of a hierarchy in the tree. Essentially, rooted trees are no different to that of regular trees. To turn a regular tree into a rooted tree, simply single out a vertex of importance as the "root" of the tree. 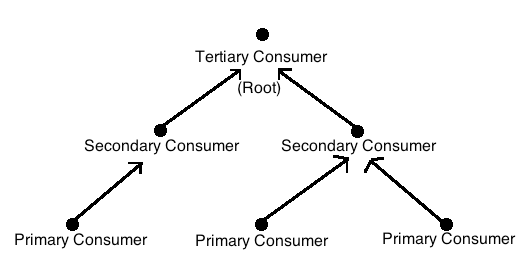 Where the tertiary consumer is the root of the tree. Rooted trees are also used in contexts such as family trees where the root of the tree is the highest known ancestor, and everyone below is a descendent.